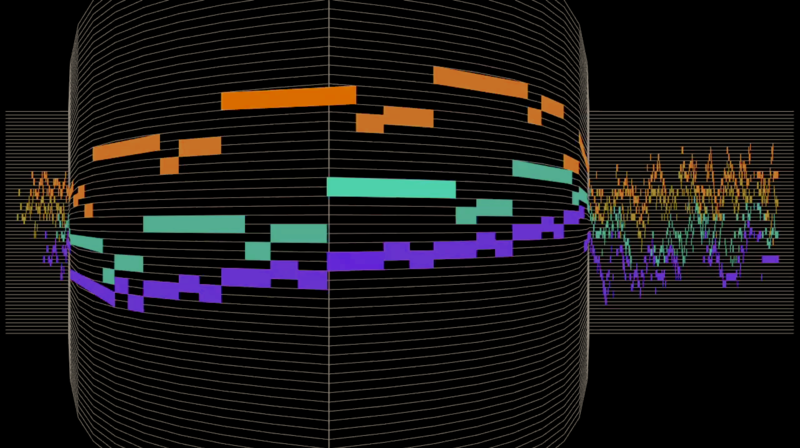 The horizontal mapping of time in the MAM display can be done in a variety of ways. fixed (non-scrolling view, scrolling now point) The entire piece is shown, and there is no scrolling; notes are typically highlighted in place. 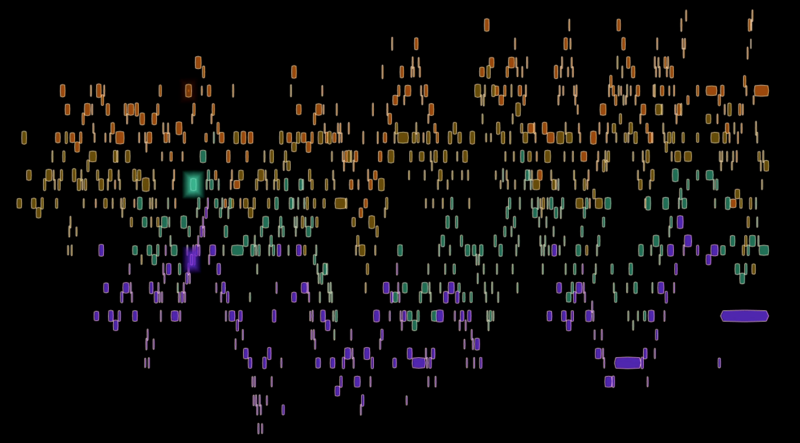 This view can be used effectively for short pieces (where the notes are big enough to see easily), or as a "big picture overview" as an accompaniment to a more standard "close-up view" (as in this Nancarrow video). full width (scrolling view, fixed now point, warp factor 1.0) This is the standard smooth-scrolling view, with the center being the now point and time mapped linearly on either side of that (warp factor 1.0 corresponds to "no warping"). full width (smooth-scrolling view, fixed now point, warp factor 0.9) Warp factor 0.9 gives a very mild warping—just a slight undulation around the now point. 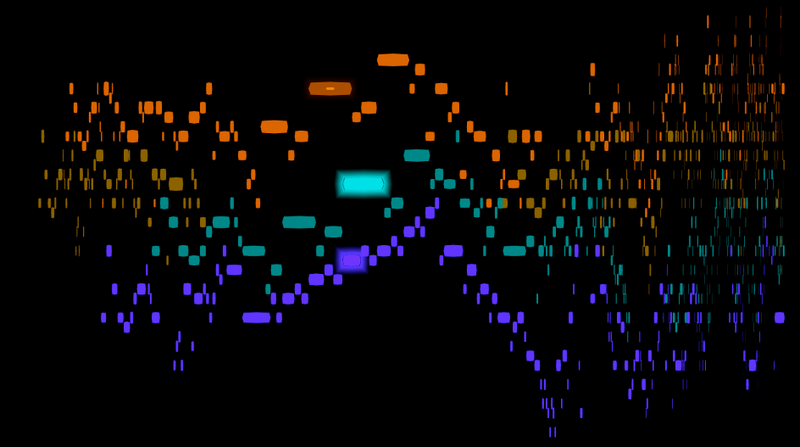 Horizontal warping was first used around the time I did the videos of Debussy's First Arabesque. 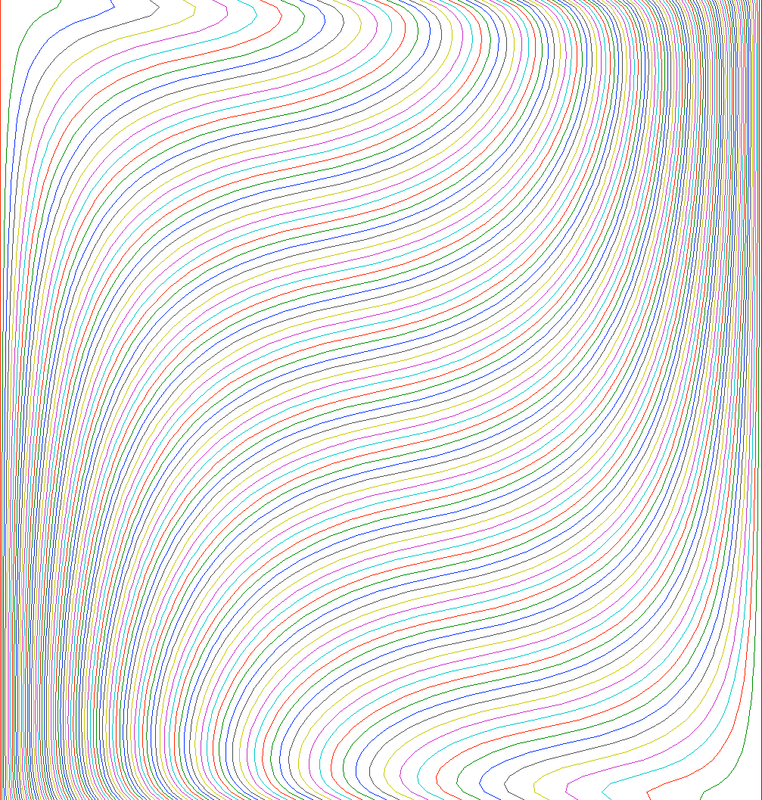 Horizontal warping interacts differently with different styles of animation; for example here is a "scrolling ribbon" animation without and with horizontal warping. full width (smooth-scrolling view, fixed now point, warp factor 0.5) Warp factor 0.5 gives a very strong warping, with notes becoming significantly wider when they are sounding (and shortly before and after). 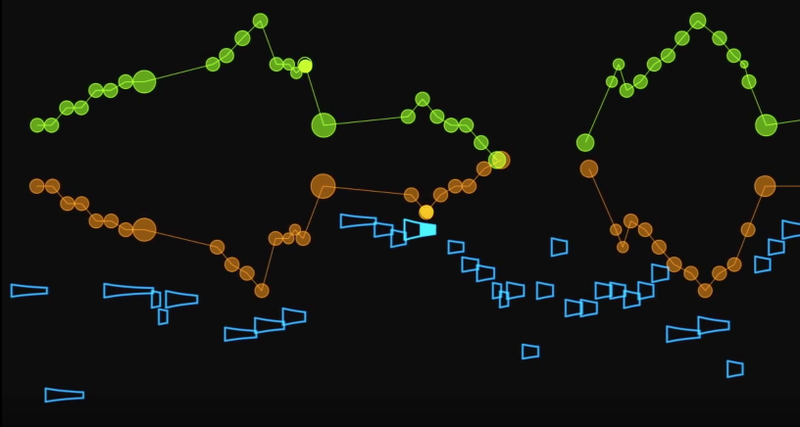 sigmoid (smooth-scrolling view, fixed now region) With sigmoid warping, there is a central now region (as opposed to a single now point) which notes extend to occupy completely (regardless of their actual duration) when they are sounding. scrolling lens (smooth-scrolling view, slowly-moving now point) Scrolling lens warping combines features of the fixed view and the full width view: the entire piece is always shown, but a shorter section is shown at a wider width, with the sections preceding and following it being compressed. The now point is always at the center of the wide center section, but as that is moving, the now point moves (though not as quickly as in the fixed display). fisheye (smooth-scrolling view, slowly-moving now point) Fisheye warping is like scrolling lens warping, but with the vertical scale also being larger in the center. This has the advantage that the horizontal-to-vertical scale in the compressed parts is not as extreme, and the structure of the piece can be seen more easily. 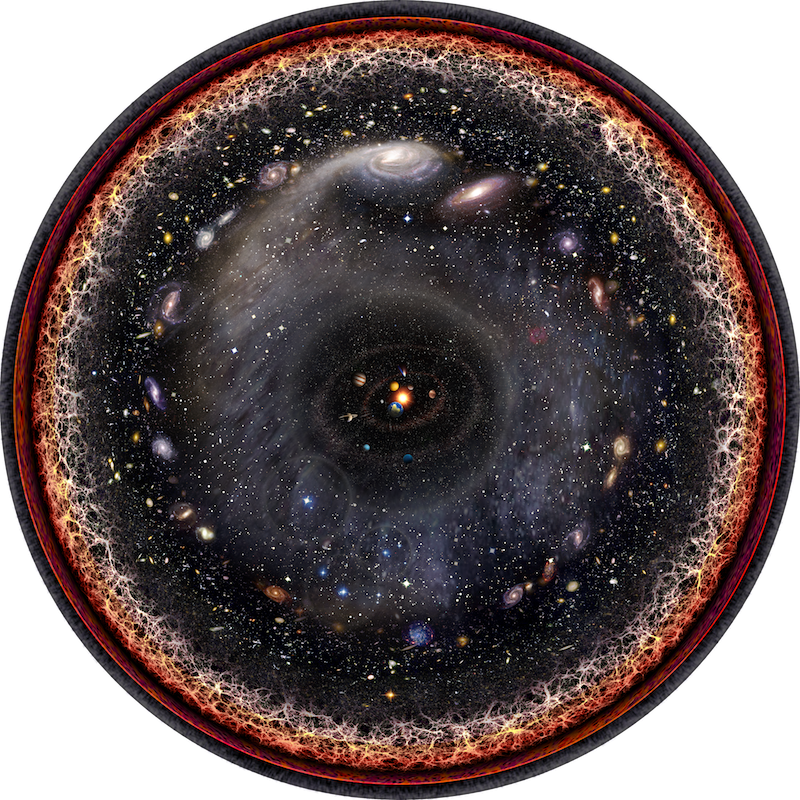 logarithmic (fixed view, sliding window, moving now point, 3-second reference) When I saw this log-scale view of the universe, I wondered "Could a log-scale display make it easier to see features at multiple times-scales in the MAM?" 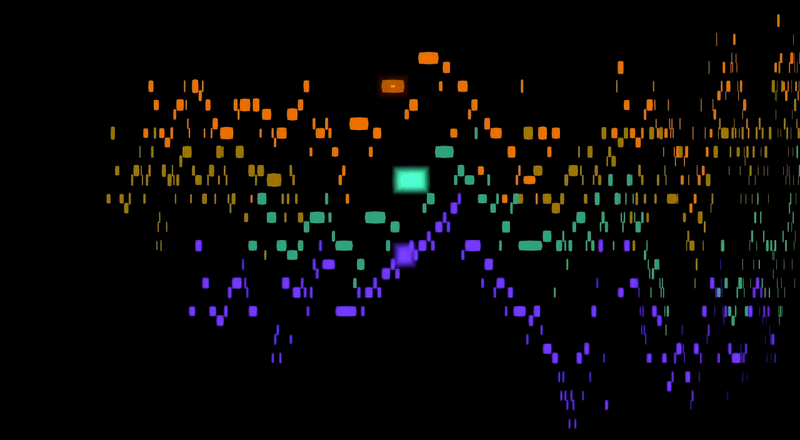 In the "fixed view" version, the start and end points of the piece are "pegged" at the left and right margins, and the now moves from the left edge to the right edge. There's a back-sliding effect at the beginning and end of this mode; it's usually a good idea to add extra time at the beginning and end so that this can be edited out (which has been done here). This log warp overview shows why this backsliding effect happens. logarithmic (scrolling view, fixed now point, 10-second reference, 140-second view) ... in this example, a longer reference time (10 seconds) is used. perspective (scrolling view, fixed now point) The perspective view results from projecting the flat score onto a curved viewing surface (simulating the compression you get when viewing objects that extend toward the horizon). 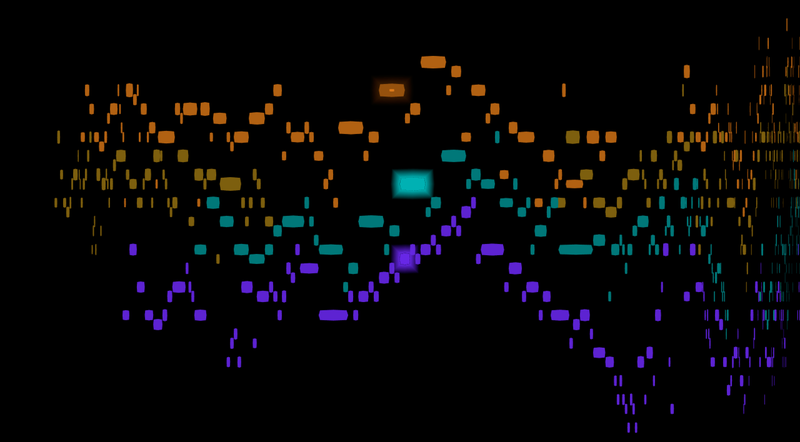 saccade (step-scrolling view, fixed now point) In the saccade view, notes are left-aligned with the now point for their entire sounding duration (and until the onset of the following note), resulting in a jerky display. 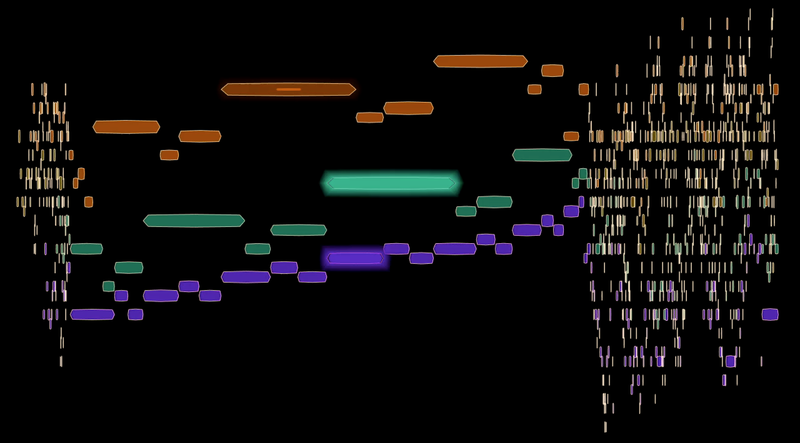 In a polyphonic piece (as in the example at left), this has the effect of calling attention to the note-to-note motion of a given part. If a part is moving regularly (e.g. 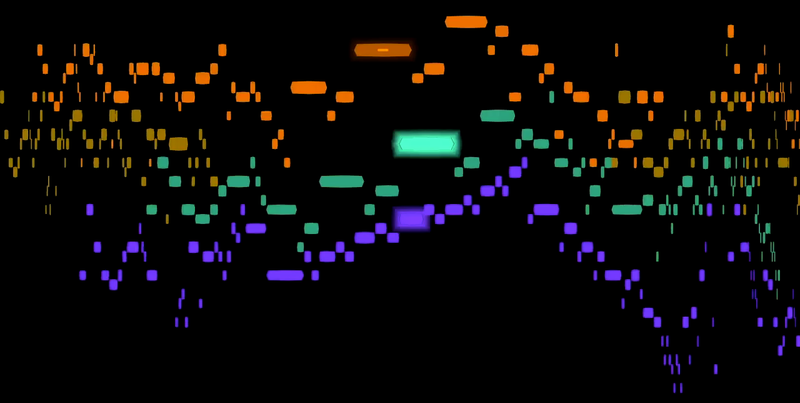 as in an unbroken stream of 16th notes), it is sometime possible for the saccades of viewer's eyes to be synchronized with the motion of the notes; if this happens, the jerkiness is no longer experienced, and is replaced by a sense that the now note is standing still, with the rest of the piece moving around it. multiple nows (smooth-scrolling view, multiple fixed now points) This is a variant of the full width display in which different parts have different now points. In the example at left, two parts have a now point at the center, and one has a now point to the left of center; this allows the symmetry of the canon to be shown.